FREEPORT, Maine - Down the street from a giant L.L. Bean duck boot parked outside the iconic retailer’s flagship store are parking lots crammed with outlet shoppers, a Rotary Hot Dog Stand, Ben & Jerry’s, and Li’s Chinese Xpress. 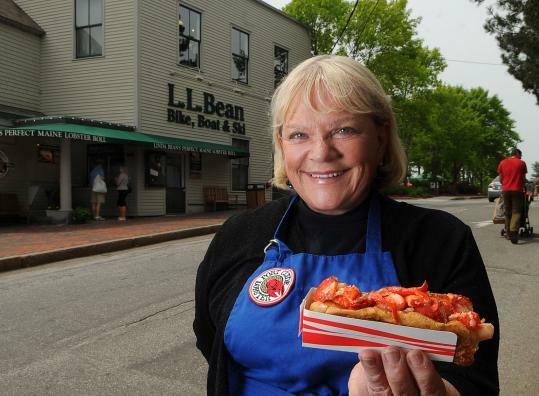 With summer’s throngs of visitors, you might miss a tiny lobster kiosk with a green awning at the corner of Main and Morse if it weren’t for the striking name: Linda Bean’s Perfect Maine Lobster Roll. A buttered and toasted hot dog bun, filled with four ounces of local lobster meat tossed with salt and a hint of mayo, comes with crunchy bread-and-butter pickles and crisp kettle chips. The cost is $16. In addition to the seasonal kiosk in Freeport, Bean plans to open a year-round restaurant across the street and another kiosk in Delray Beach, Fla., this summer. She has licensed a stand to Tim and Hilary Miller of Hingham, who opened a beachfront location on Nantasket Beach in Hull at the end of May. The couple want to open more kiosks between Boston and Cape Cod. The Maine lobster industry has been in a slump that predates the recession. In 2008, Maine commercial lobstermen caught 67 million pounds of the crustaceans valued at $236 million (that’s an average of $3.50 a pound), according to 2009 Department of Marine Resources data, but the catch fell $50 million from the previous year. Now, in light of the global recession, the Maine lobster industry is bracing for more tough times - especially as lobster prices have reportedly fallen to that of bologna. That hasn’t stopped Linda Bean. Over the last two years, Bean has bought wharves, infrastructure for a processing plant in Maine, and rolled out a line of branded live lobsters whose claw bands state their exact wharf of origin. She’s also sending out something she calls a Lobster Mobile to state and county fairs. Recently, one project in Portland was to create a Guinness World Record for the longest lobster roll (it was 61 feet). Bean is new to all this. Until Feb. 28, 2007, the day before her divorce was finalized, Bean (who sits on the board at L.L. Bean) had been living in Port Clyde as a homemaker, tending her gardens, watching boats in the harbor, and, despite her affection for buttered, toasted lobster rolls, wasn’t an insider. Then, she was approached about buying a wharf in Port Clyde, then known as the Bay Lobster Co., where about 25 boats sell lobsters. She later acquired another wharf in Vinalhaven. And she hasn’t really stopped buying lobster. “Maine lobster dealers haven’t had anywhere to go in Maine with processor-grade lobsters,’’ says John Hathaway, president and CEO of Shucks Maine Lobster in Richmond, one of four other lobster processors in the state. Much of the lobster processed in Canada originally comes from Maine. “What’s happened when 70 percent of Maine lobster ends up as Canadian product, in my opinion, is it destroys the Maine brand,’’ Hathaway says. Besides lobster rolls, Linda Bean’s Perfect Maine Lobster offers two items: Maine-made hot dogs ($3) and shrimp rolls ($8). The entrepreneur has become a full-blown cheerleader for lobster rolls. “I can eat them for breakfast and never get tired of them,’’ says Bean. Linda Bean’s Perfect Maine Lobster Roll, 57 Main St., Freeport, Maine, 207-865-1874 and 163 Nantasket Ave., Hull, 781-925-9252, or go to www.lindabeansperfectmaine.com.